The Shelby Dynasty, a political machine named for its locus in the town of Shelby, controlled state government for 20 years (1929-49) after gaining power with the 1928 election of Governor O. Max Gardner. At that time leaders of the Democratic Party, which maintained a firm grip on state politics, informally agreed that the eastern and western sections of North Carolina would alternate the one-term governorship. Four years later the Shelby dynasty (or Shelby ring, as it was also called) supported J. C. B. Ehringhaus of Elizabeth City. In 1936 Gardner's brother-in-law Clyde R. Hoey, also of Shelby, won the election. He was succeeded by J. Melvin Broughton of Raleigh and then R. Gregg Cherry of Gastonia. The conservative-to-moderate faction determined who would run not only for governor but also for other state and congressional offices. After having led the state through both the Great Depression and World War II, the Shelby dynasty engendered discontent by the election of 1948; blacks were dissatisfied, public schools needed more buildings and many repairs, and the road system had not received sufficient attention since the 1920s. The dynasty's candidate in 1948, Charles M. Johnson, lost to W. Kerr Scott, a member of the more liberal "Branchhead Boys," who won on the promise of good roads. Lee B. Weathers, longtime editor and publisher of the Shelby Daily Star, argued that the earliest incarnation of the Shelby dynasty was actually a move to restore democratic government to Cleveland County after the Populist and Republican Fusion had controlled the county government in the 1890s. Among its early leaders were two brothers who both became judges, James L. and E. Y. Webb. James Webb's daughter Faye married O. Max Gardner, and Gardner's sister Bess wed Clyde R. Hoey. Hoey, the Webb brothers, and Odus M. Mull, who served six terms in the North Carolina House of Representatives and six years as chair of the State Democratic Executive Committee, made up the core of the Shelby dynasty under Gardner. Some historians have included Weathers himself as a member of that group, which had such strong influence on local and state politics. Joseph L. Morrison, Governor O. Max Gardner: A Power in North Carolina and New Deal Washington (1971). Thomas C. Parramore and Douglas C. Wilms, North Carolina: The History of an American State (1988). Lee B. Weathers, The Living Past of Cleveland County (1956). "Shelby Dynasty." National Park Service. 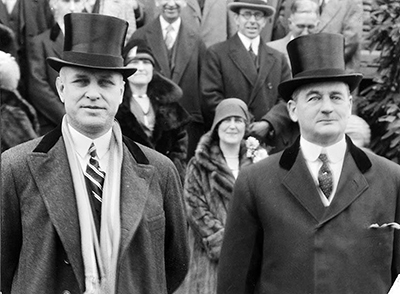 http://www.cr.nps.gov/nr/travel/shelby/dynasty.htm (accessed October 12, 2012). Tarpley, Cassie. "The Gardner Family: The Rise of a Dynasty" The Shelby Star. January 3, 2000. http://www.maxgardner.com/family/rise_dynasty.asp (accessed October 12, 2012). Patterson, U. L. "Rusty," and Hambright, Barry. Shelby. Arcadia Publishing.2007. http://books.google.com/books?id=vIjUtTOeGYkC&printsec=frontcover#v=onepage&q&f=false (accessed October 12, 2012). "Photograph, Accession #: H.1929.19.2" 1929. North Carolina Museum of History. 1 January 2006 | McCraw, Paul L.